I added a little bling to the Birch Tree outside our home. I've been wanting to make handbags for awhile. I want them to reference my scarves so I'm felting on top of silk and also felting in various threads and yarns for embellishment. The texture on the inside is beautiful and I'll try to have a picture of that tomorrow. It's easy to tell we are nearing the shortest day of the year. Even in the outdoors the lighting is not so great. We had a little snow storm over night but it's supposed to turn to rain later today. I hope it doesn't. I love snow and I love winter, and when it arrives I want it to stay. I can't believe another year is almost over. I've never been one to set goals. I just sort of take things as they go but if I'm going to succeed as a full time Craftsperson/Designer-Maker/Artist (does anyone know what we are calling ourselves these days? ), I'm going to have to make a plan and follow through. So more about that later as well. Good news from the Shop in Toronto, Margot received them on Thursday and sold two pieces on Friday! Stay warm all. I finished the order for the shop in Toronto yesterday and put the work in the mail. I met Margot at the One of a Kind Christmas Show last week. 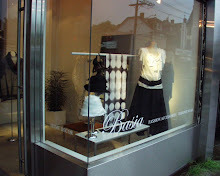 Her shop, Any Direct Flight , is on Queen Street East and I'm really excited to have my work there. As you can see, I don't have really exciting packaging at the moment so that's the next thing I want to work on as well. I do have lovely Hangtags though so that's one thing I can mark off my list! I'm working on a Grant Proposal today but I'm also hoping to make a few pieces in the studio today. I dyed the most beautiful green a few days ago and I'm anxious to make more pieces using that fleece. Happy Friday! As I said previously, I'm determined to take (good) photographs of my work but I've got to say...taking photos of textiles is one tough nut to crack! I felt on different types of silk and here I'm using a Silk Pongee. The felting creates an amazing texture on the back. They are so soft and light but extremely warm. I'm working on an order for a shop in Toronto called Any Direct Flight so I'd better get to work! Have a nice day. And just like that, the One of a Kind Christmas Show is over for another year. Happens every year, I worry and stress until my booth is set up and then I kick myself for never having enough work! The photo of my booth was taken on the second last day after I removed a set of ladders in an attempt to make the other ladders look like they contained more work. My work sold very well I am very happy to report. Thank you to all those who made purchases and stopped by to talk about the work. Although Felt is considered the 'first fabric of civilization' (it says so on my Hangtags!) alot of people don't know what they're looking at when they first see my work. Most people are amazed when they realize just how much work goes into making felt. In an attempt to speed up production I'm going to start searching for a small woollen mill that might be willing to custom dye small batches. The photo of the Christmas Tree was taken outside the Eaton Centre on Younge Street. When you live in a city of just 26-thousand people it's nice to get to the 'big city' once in awhile. take care. I've been working at the YMCA's Youth Employment Services since August but last Wednesday was my last day. I may work there again, but not until I return from the One of a Kind Christmas Show which is this week in Toronto. I've been working day and night to try and make as much work as possible to bring to the show but with a full time job I probably won't have a much work as I would like. It has been very nice getting a cheque every two weeks. I haven't known that luxury since I left my job at the alberta college of art & design over 3 years ago. One of the hardest things I have ever tried to do in my life is start my own business. I've made alot (and I mean alot!) of mistakes but I've learned a great deal over the past three years and one thing I know for sure, is that I'm not giving up. I've given up a great deal to try and make this work but these are small sacrifices for the short term that I know I will get back in spades someday soon. And finally today, for those of you who do not know me personally, you should know I love animals. I own three cats (Isabelle, Victoria and Coalie), and I live with a wonderful dog name Blackie, and one gerbil and one hamster. Everyday I take Blackie for a walk and mostly we like to wonder around in the woods not too from where we live. I spotted four birds nest today which must be some kind of record! When I spot a nest it's like discovering a secret. Take care. I went to Paris about five years ago and lately I've been really wanting to go back. 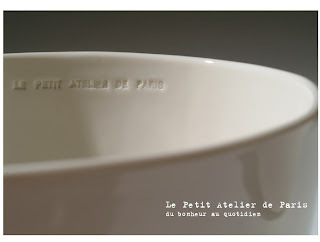 I still haven't had a chance to photograph any of the work I've been doing lately, so I'm hoping this beautiful Website that I discovered lepetiteatelierdeparis will do for now (instead of showing some of my own work!) I found the site on poppytalk which is one of my favorite blogs to visit. Since starting my own blog, I've discovered so many more and I'm absolutely mesmerized by the beautiful work being done by Artists, Craftspeople and Designers and I'm so glad that they have blogs too! enjoy the day. Last year I started making felt balls to sell. I made them in order to be able to offer something that wasn't as expensive as my scarves and shawls. I sold them as Pin Cushions, (complete with pins). I wanted them to reference my scarves so that's why I wrap them with the yarns I use on my scarves. I started making them again last week and took them along on my walk today. I love Fall. I love how the leaves seem to be floating in mid-air waiting for one gust of wind to take them to the ground. I'm making work these days for the upcoming Christmas Shows. Soon I hope to show some of that work but I'm still struggling with photography. I took this picture almost a year ago. Time really does go by in the blink of an eye, doesn't it? This is Merino wool, felted on Silk Pongee. I lay on Silk and Wool yarns, and everything becomes 'one' in the felting process. The perfect color red can be my nemesis at times. It's probably because I don't keep meticulous dye notes. I find so many things change from day to day, that I just use my notes as a point of reference. I love all the colors I dye but every now and then Iproduce what I consider the 'perfect' red (or pink...or indigo blue...). I'm still trying to figure out how to properly post things and where exactly, they will show up on my Blog. 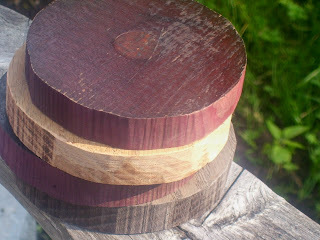 The wooden circles are what I use to resist the dye when I'm creating my 'Circles' Collection. (See the Shawl on the left.) 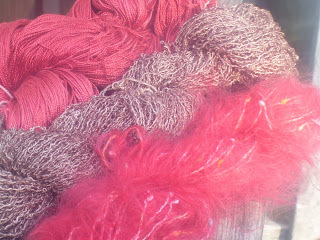 I hand dye all my materials and I work mostly with wool and silk. This is wool and silk felted together. Merino fleece and silk chiffon to be exact. I make 'soft felts' and cut the shapes out, then stitch them on before the felting process. 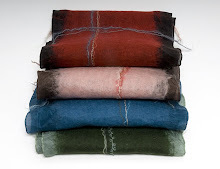 Felting is a magical process and considered to be the first fabric of civilization . I'm trying to figure out how to photograph my work which is not easy. Textiles are hard to photograph, particularily when I'm trying to show the drape of the fabric and the smaller details of my work. (It's all in the details, baby.) I'm using a very inexpensive digital camera. I am also taking all my photographs outside and I'm using a tripod. You really can't have a Blog without photos. At least not an interesting one! So my goal this weekend is to start taking photos of my work. As a Craftsperson, trying to establish my own business, the last thing I seem to have time for is documenting my work. This weekend, I'm hoping to change that.